Lucky came to Hog Haven Farm in October 2015, after taking the courageous (life-saving) leap from a slaughter truck on the highway. Picked up by Weld County Animal Control, Lucky’s transporter had 5 days to come forward and claim him; we are grateful they didn’t, because now this gentle giant can live out his days at our sanctuary. Lucky is a big boy, but one of the sweetest pigs. He is gentle enough to allow children in his pen for visits (with adult supervision, of course), and he thoroughly enjoys belly rubs, being brushed, and a good wallow in the mud. 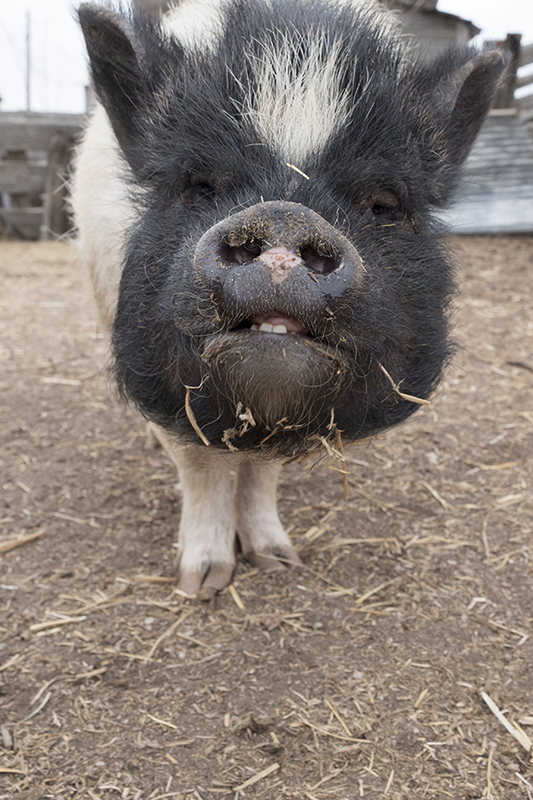 Wilma came to Hog Haven Farm in the spring of 2016, with a Hampshire pig we named Journey. These two girls were being sold together on Craigslist for meat, and we were able to work with a donor to pay for them so they could come live at the rescue. Wilma, who we fondly nicknamed Squish, is a very sweet girl who was overweight at time of rescue. 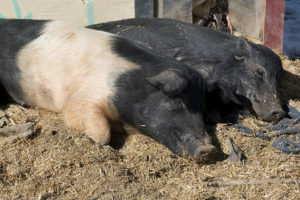 There is a small problem in the Denver area of potbellied pigs being sold as meat animals, and as a cheaper alternative to their standard cousins. Erin fell in love with Wilma, and as such, Wilma will live her days out on the sanctuary among her new found friends. 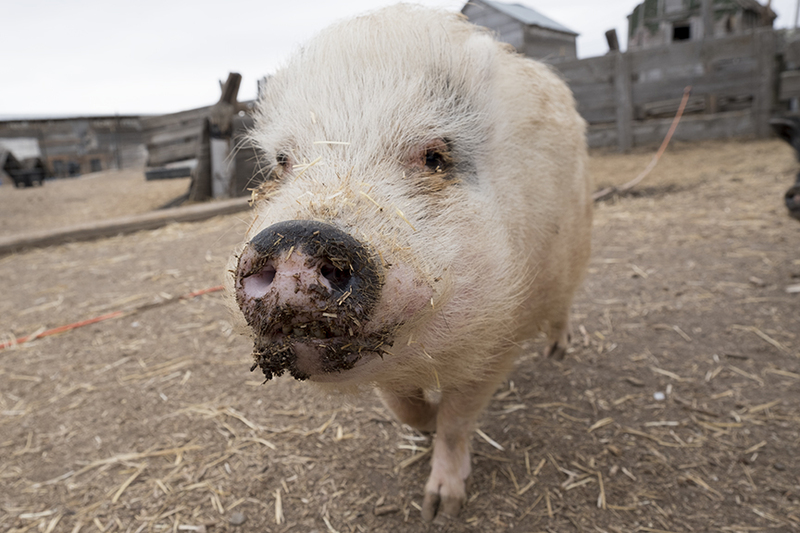 Nala came to Hog Haven Farm in summer 2015 from another rescue, and after a scary dog attack that left her nearly decapitated. Nala cannot be placed in an environment with dogs, and we have decided that she would be best suited to live her life out at the sanctuary. She came to us with 4 other pigs, and still shares her pen with one of them, Marley. Nala is a total sweetheart to our visitors, and loves a good rooting session, belly rubs, carrots, and pumpkin. Journey came to us with Wilma in the spring of 2016, and was saved from slaughter! 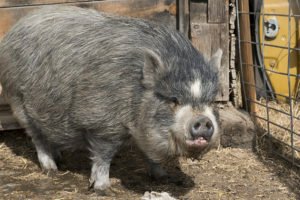 A Hampshire, she is considered a standard breed, what are usually bred for the meat industry. She has amazing floppy ears and is considerably taller than the potbellies–they are truly mini in her presence! 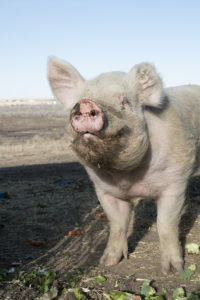 Journey is a goofy pig, not aware of her size, and as such, can seem like a menace when treats and food come out. She is a very smart girl, though, and our volunteer and friend Debbie taught Journey to sit within a few minutes! Mama came to us with a few other pigs from another rescue (Nala, Marley, Hammy and Dixie). We estimate her age to be close to 10, though we do not know it exactly. Mama has the long snout that is characteristic of a wild pig, but her size and stature are more of a potbelly. Little of her history is known, but she is skittish around new people and shy to the touch. Her previous rescue assumes she was abused in her earlier days, and as such, Mama gets to live her life on the sanctuary with her friends. She and Journey have a strong bond and inseparable. Lincoln is the resident “rotten” pig of Hog Haven Farm! He came to us summer 2015, as an adorable 5 month old piglet. He was rescued from the backyard of a family that wasn’t very interested in keeping him as a pet, and wasn’t getting the attention and love he deserved. The woman who took Lincoln in originally made an agreement with us to keep him, and has been a big part of his life since, even though he cannot live with her. Lincoln is surrounded by friends, and loves to root, splash in the mud, and eat as many snacks as he can get. When the carrots come out, Lincoln will cram as many as he can into his mouth and run off to eat in peace!